To be a Filipino working overseas means having to sacrifice time away from family and loved ones and foregoing a big part of one’s earnings for the assurance of a better life for them. Worse, for quite a time in the past, the overseas Filipino worker was denigrated as one who turned his back on his country, causing brain and skills drain, for personal and selfish motives. Over time however people’s thinking changed. The OFWs’ public image changed, from bad and ugly to good and likeable, from public villain to folk hero. The OFWs have become and are acknowledged by the Philippine government and national leaders as the country’s “new heroes”. They rightly deserve the national tribute and their compatriots’ admiration. They do because becoming a major export of the Philippines and substantial earners and remitters of foreign exchange, they substantially helped in bailing out the country from its financial and economic woes and provided the means to jump-start and sustain national recovery and growth. No other institution realizes the substance of this as much as Philippine National Bank, which has established international banking services for the Filipino since 1917. In Japan, PNB has been providing the Filipino worker his financial and banking needs for 20 full years now. This is why every Pinoy in Japan knows where to run to when sending his remittances to his family in the Philippines. PNB Japan started out as a representative office in 1967. After studying the banking necessities of Filipinos in this country for more than 20 years, in June 1996, it was granted a full banking and foreign exchange license which enabled its facilities to cater to more Filipinos in Japan. PNB Japan has since then offered a wide range of banking services, not only as a medium for remittances, but also in housing loans. 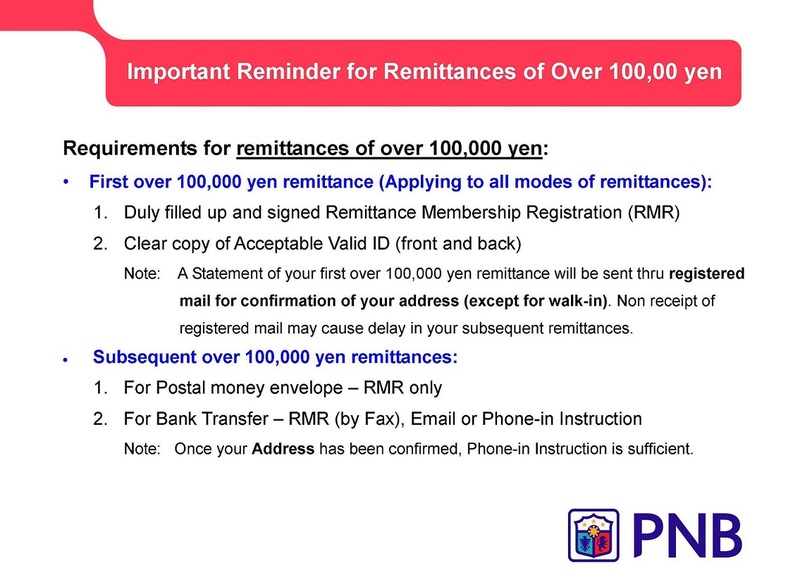 PNB Japan also accepts dollar and yen savings and time deposits. In May 2003, it extended its hand to Pinoys in Nagoya, Central Japan, where its services can now be accessed not only by those in the Tokyo area but also those near Japan’s western regions. PNB Japan has been offering 20 years of its consistently reliable service to the Filipino in the land of the rising sun. It has continued to improve its services to meet with their ever-changing banking needs. Recent technology, the constant altering of Pinoy migration patterns, the changing demands of Pinoy communities in Japan, anti-terrorism and anti-money laundering laws has greatly shaped the way PNB Japan has handled its customers and clients. But it has faced up to the dictates of these challenges and has risen up victorious, maintaining satisfaction among its market in those 20 years. It has upgraded its online remittance system, ensuring prompt delivery of remittances to beneficiaries in the Philippines. It has incorporated the best database system to keep essential information on records of clients, guaranteeing compliance with anti-terrorism and anti-money laundering regulations. PNB Japan’s partnership with Mizuho Financial Group Banks and its service using the Internet and the Japan Post facilities make its services conveniently accessible to Filipinos all over Japan. PNB Japan, with its 20 years of harmonious and mutually beneficial relations with Filipinos in Japan, is more than a banking institution to those who come seeking for its services. It has helped recognized Pinoy associations fulfill and deliver their messages and activities to the public. It has combined its objectives and efforts with established institutions and government bodies that aim for the welfare and good of the Filipino people. PNB has also been called “home away from home” by many, if not by most. It can be said that PNB Japan’s success in its 20 years lies in its commitment to the Filipino people, recognizing its heroism and love for its people and country, making PNB the OFW’s partner and conduit in Nation building. PNB Japan wishes to continue this partnership for years to come. Rates are subject to change during the day.